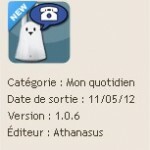 Violet lance officiellement son Karotz sur le marché US. 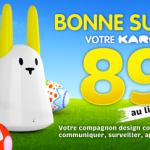 Il s’agit dans le positionnement de l’objet du premier Lapin Intelligent compatible avec les réseaux sociaux. Pour coïncider avec les lancement des compagnons robotiques que sont les lapins intelligents, Violet a développé un nouveau Karotz – le premier hardware pour Facebook et Twitter disponible exclusivement aux US. 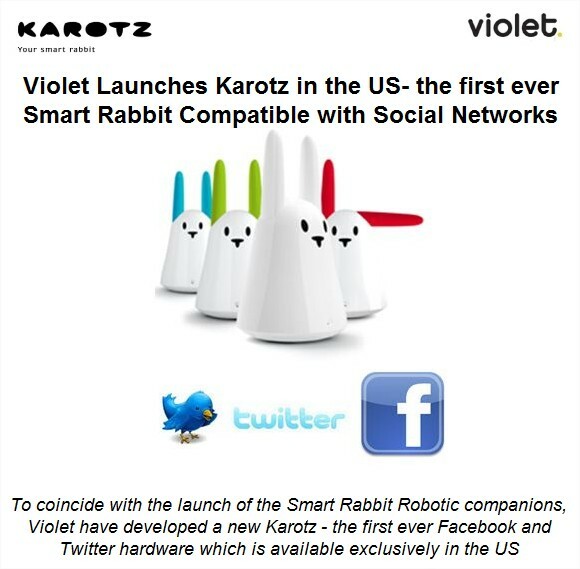 CES, Las Vegas, 10th January – Violet is excited to announce the long awaited US launch of the Karotz smart rabbit which is the first ever hardware device which has been tailor made especially for Facebook. 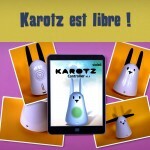 Karotz is the third generation of the multipurpose, internet-connected rabbits that first launched in 2005 as Nabaztag, and has since become a worldwide phenomenon. The immensely popular robotic companions transform daily life by providing a link to the family, friends and the world and now the compatibility with Facebook is a wonderful addition to Karotz’ already extensive range of features. 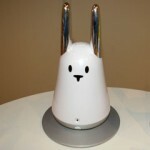 This smart rabbit enables its owner to connect to their Facebook account and is the first ever hardware device to be compatible with the key social media sites (including Twitter) allowing people to interact via their favorite companion. Now friends can take control of your new companion Karotz to communicate with you by sending messages and audio files, using the Karotz integrated webcam to see what it sees, sending a poke or moving Karotz’ ears and changing the color of its light to get your attention. Karotz can even record and post status updates as an audio file, text or photo directly to your Facebook wall. In fact Karotz leads us to a new interactive experience in order to benefit from the richness of the Internet, which opens up a new form of connected lifestyles! Karotz is a clever rabbit and can respond to questions and requests by using advanced voice recognition software and the internet to search for what its owner is looking for. The connected companion has the ability to play music; check for new emails; read the weather forecast, RSS feeds, tweets and more. Karotz has also the ability to share what it sees or listen, using its camera or microphone. Karotz is at the heart of people’s lives and in sync with all the important events in the day. Violet also offers a wide range of Karotz accessories including the Nanoztag and the Flatnanoz key ring tags which feature RFID chips and can be used to launch an application or to check in and send an email to alert the Karotz owner when their child or roommate is home. Karotz owners can customize the look of their little buddy with a USB tail or Skinz tattoos. The free Karotz Controller application is currently available from the Appstore and on Android Market! 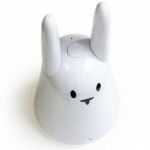 The Karotz smart rabbit is available now at Karotz.com, Amazon.com, Brookstone.com, J&R.com, Computerworld.com, thinkgeek.com for $129.99 MSRP. Follow Karotz on Twitter @Karotz and facebook.com/KarotzSmartRabbit for the latest news on the popular smart rabbit. Karotz is inquisitive! Yes, but it can also inform you when your child arrives home from school. Karotz is unlimited! Yes, but you can control it remotely. Karotz talks a lot! Yes, but it can also read e-mails and instant messages. Karotz does everything! Yes, but it can also wake you up every morning. If you wish. Karotz is a multipurpose Internet-connected rabbit. He moves his ears, speaks, reads, listens, his body lights up and he even detects the presence of other objects (by sniffing them). As he is permanently connected to the Internet, he can act, react, transmit or broadcast many types of content available over his network, – news, messages, music, text, alerts, radio, etc. He can hear you, obey your commands and even recognize things you give it to “sniff”. Born in 2005, Nabaztag has since become an Icon for the new era of smart, communicating objects. Karotz was launched in 2011 and is the third generation of multipurpose rabbits. Amongst the new features, Karotz also knows how to see and can show its owner what it sees wherever they are situated in the world and they can also listen via a PC or a Smartphone. Le Karotz s’est-il endormi…avant de nous faire tourner en rond ? Quoi de neuf pour le lapin ? Une maj des Karotz existant ? D’après mes informations il s’agirait du même lapin. La même base technique mais avec un positionnement commercial différent autour des réseaux sociaux. Ils pourraient bénéficier des applications Twitter et Facebook en premier. Ce n’est donc pas a priori une nouvelle version.